Yesterday, my sister asked me how to convert avi to apple TV. She wanted to share her favorite movie with us, and to watch movie on TV together. She felt so annoyed because apple TV cannot accept avi files directly. I told her an easy way to convert videos and transfer videos to iPad, iPhone, iPod, apple TV, iMovie ect. This makes it easy to share your favorite movies with your friends and makes it possible to watch movies wherever and whenever you like. Come on, let' go to see how to convert avi videos to apple TV! Just follow me, and we can do it together. Before we start, please download best video converter, install and run it on your computer. This will make things easy, and you will get your favorite videos in good quality, bright and clear. 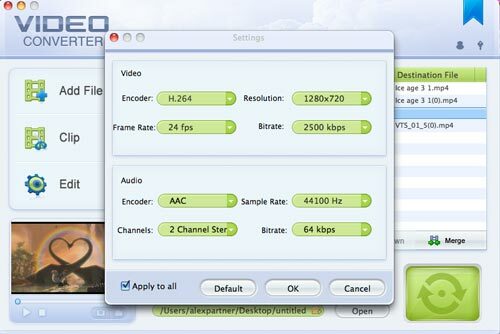 I use Mac, so I choose Mac video converter to help me finish the whole procedure. When you run it, you can see its user-friendly interface. It has creative features and is super easy to use. You can edit the files, clip them and add some special effect to them. You can preview the movies in the small preview window, and take some wonderful snapshots if you like. Click Add File icon to add the video files you want to convert, you can add several files at one time, and order them if you want to merge them together. You can add videos in various formats, such as in avi, vob, flv etc. Step 2. Choose right formats and set formats details. 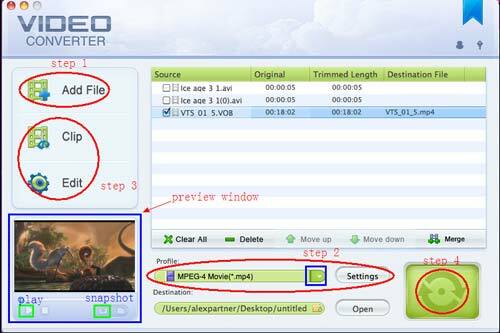 Clik the triangle of Profile, you can choose a right format for your output movie, you can choose to convert it to iPod, iPad, iPhone, PSP, BlackBerry, iMovie, iRiver etc. 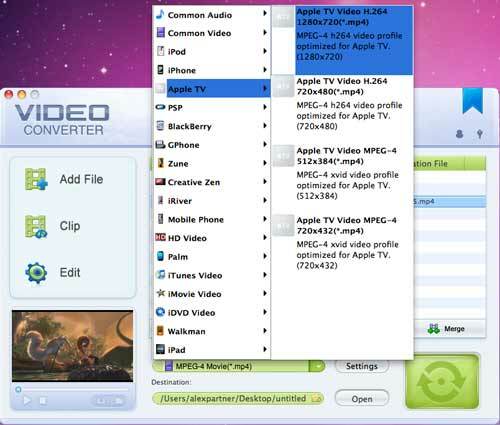 while we will choose to convert it to apple TV, and choose Apple TV video H.264 1280*720 mp4 formats. It has high quality, bright and clear. Click settings icon, you can choose Encoder, Resolution, Frame Rate, Bitrate for video and choose Encoder, Sample Rate, Channels, Bitrate for audio. If you'd like to keep original setting, just click Default, or Apply to all. Don't forget to click OK at last to save all your settings. Step 3. Edit video files. This step is optional. You can crop and edit the video files, and make it your own favorite video. Step 4. Choose an output path for your output files and convert. Click the folder in the bottom of the panel to choose a place for output videos, and click the big green convert icon, which is on the bottom right of the interface, to start converting. Wait for a while, you can get your favorite video and transfer it to your apple TV. 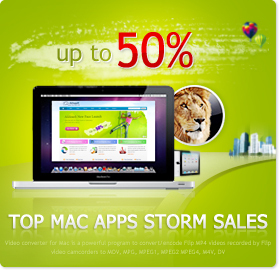 Download best Mac video converter and convert your favorite video and share it with your family and more friends now! Find more Mac video tools to convert and edit videos.